It’s fun, I sup­pose. The visu­al of a “Bacon Rib­bon” makes per­fect sense and good humor. Aren’t rib­bons get­ting out of hand? Are we real­ly remem­ber­ing any­thing with the fuch­sia striped rib­bon with the gold stars? 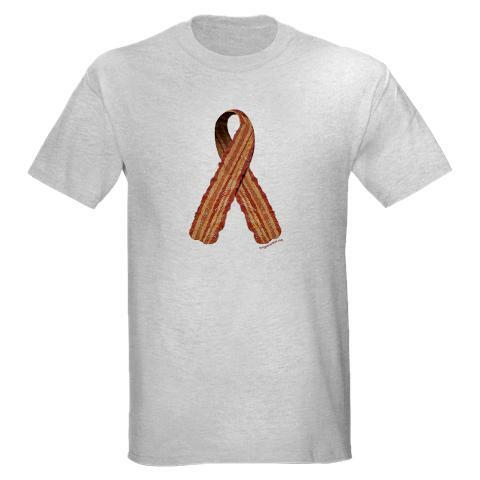 At least the Bacon Rib­bon reminds us that we’d rather be eat­ing bacon! The next time some­one tries to push a rib­bon on you (or your car … or your …) or the next time you see some­one sport­ing a ran­dom rib­bon… point them in the direc­tion of the Bacon Aware­ness Bacon Rib­bon cam­paign: the only unam­bigu­ous rib­bon … that is exact­ly what it means… a Rib­bon on Bacon! This entry was posted in Cooking, Life and tagged bacon, bacon awareness, bacon ribbon, bacon t-shirt, life, meat candy. Bookmark the permalink.